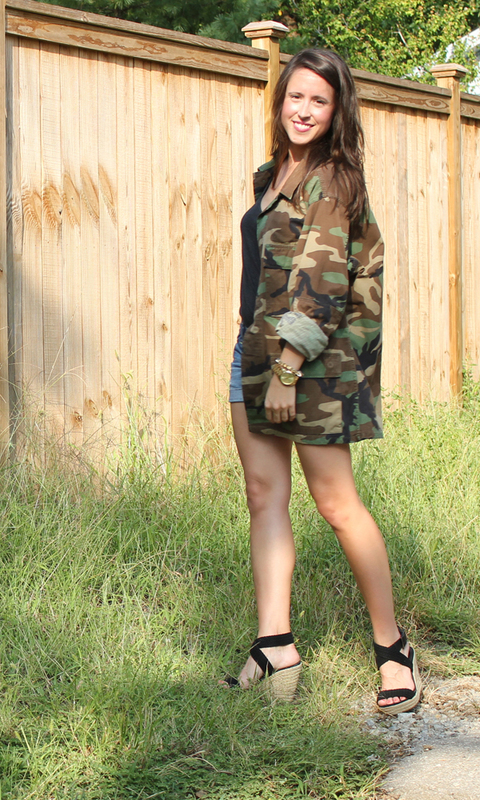 This past weekend I scored - I'm not sure legit army issue camo jackets come in XS, but actually love the over-sized tom-boy look of this camo gem balanced with fitted basics and girlie wedges. Is camo on your shopping list for Fall? Is camo country or chic? I think the gold big jewelry makes it work perf.ect.ly. Smart girl to get the camo on the cheap! I'm with you, I won't spend a lot on a trend unless I think it'll be sticking around for quite a while. My BF has wanted a pair of camo cargo shorts forever but I always give him the "please don't" look. Don't tell him that I've been eyeballing a camo jacket from Zara though, hehe. hahaha my husband would love this. that guy LOVES him some camo. You look adorable. Those shoes add such a femine element to the whole look. Great find! How awesome is it that camo is such a popular trend this fall! AW. I love this look. I have always been into the Army Jacket stuff but felt like I couldnt pull it off. Cute! I'm not one for camo but you rock it well! I love the camo on you! :) You look super cute! I don't think I've ever rocked camo before, but you are looking adorable and down-to-earth in it today! Those wedges really dress up the outfit. I think just about any print, if done right, can look chic. I recently thrifted a camo jacket/blazer and I plan to show a little country chic. Now, it is the wedge sneaker trend that I will NOT be tempted to try! not sure I'll be rockin camo this season, but I totally love those wedges! Oooo, I love that jacket! I'm with you--I'd love to add some camo to my closet, but if I do it will most likely come from the thrift store! I love the way this jacket adds some sass to a shorts and tee look!